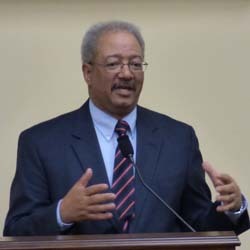 The Alliance for Space Development, which plans to advocate for U.S. government legislation and other initiatives to help hasten the development and settlement of space, has an advocate in Rep. Chaka Fattah (D–Pa.). Lifeboat Foundation helps launch the Alliance for Space Development (ASD). February 26, 2015 — The Lifeboat Foundation is working with ten other organizations including the National Space Society and the Space Frontier Foundation to launch a new strategic alliance for space development and commerce named the Alliance for Space Development (ASD). “We are pushing very specific pieces of legislation,” Charles Miller, executive coordinator of ASD, said at a Feb. 25 press conference at the 2325 Rayburn House Office Building in Washington DC announcing the formation of the group. Perhaps the most ambitious part of the ASD agenda is a proposed “Cheap Access to Space Act” that would offer $3.5 billion in government prizes for the development of reusable launch vehicles. Those prizes include, in a draft version of the bill provided by ASD, $1 billion to the first fully reusable vehicle that can place at least one metric ton into orbit and fly again a week later. Charles said the proposed bill is based on the belief that economics, and not technology, has inhibited the development of reusable launchers. “We have, in most respects, the fundamental technology,” he said. “We think the number one issue is closing the business case.” A large prize, he said, would incentivize development of reusable launch vehicles. ASD has already lined up a sponsor for another element of its agenda. Rep. Dana Rohrabacher (R–Calif.) has agreed to introduce a bill that would amend the National Aeronautics and Space Act to make space settlement and development an official national purpose. “That will be introduced soon,” Charles said.